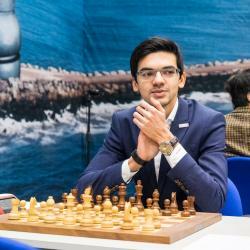 Anish Giri is the Netherlands premier chess prodigy. Giri started to play chess at the age of 6 years old and became a FIDE Master in 2008 at the age of 14. Within a year of becoming a FIDE Master he became an International Grandmaster at the young age of 14 years, 7 months and 2 days in 2009. When he achieve his Grandmaster titled, he was the youngest in the world at the time. At the young age of 19, he has astounded even the strongest players in the world, many dubbing him a future challenger to the throne! Recently rising to the 5th spot in FIDE’s top player rankings (December 2018), perhaps the most amazing thing about Giri is how little time he’s had to devote to chess! A full-time student, Giri recently finished his studies and plans to pursue a full time career as a chess professional and eventually challenge for the world championship title. He has previously played under different countries but is listed in the Netherlands federation right now on his FIDE profile. Giri describes his playing style as a “pretty universal playing style...sometimes I am very sharp when I play and less at other times. My game depends on my position”.